Hay River has “The Great Trail” system that runs from the edge of town to the edge of Great Slave Lake. This almost continuous trail system runs along the Mackenzie Highway, through New Town, along the Hay River, through Old Town and out to the sandy beaches of the Lake. Where the highway ends and the lake and sky begin. “The Great” Trail starts down the Mackenzie Highway near the turn-off for Fort Smith and follows the old highway, currently the Mile 5 service road, and into New Town. The trail runs by the Bob McMeekin Chamber Park where you can take a rest and watch the river roll by from the comfort of park benches and picnic tables. The trail now runs along some of the Town’s streets to finally join up with the Kiwanas Nature Trail Head, where it turns down to follow the winding curves of the Hay River. The first stretch of the Kiwanis Nature Trail was started about 35 years ago – and it has seen continuous use and improvement in the ensuing years. Starting at the ‘trail head’ at the DJSS grounds, the trail winds along the bank of the river for a couple of kilometres – and, for parts of it, you can believe you are not in the heart of a busy, modern community. At no point in this first stretch are you more than a few metres off Riverview Drive, the opposite side of which is lined with some of the first residences built when Old Town moved to New Town. Although the trail is very well-used all year by residents, this has not deterred a healthy segment of small wildlife and you may glimpse fox, rabbits, squirrels, owls or any number of birds as you stroll along. The preservation of a large amount of the underbrush has meant that many small songbirds, warbler and sparrow species, nest in the area – and don’t be surprised to be yelled at by a slightly irritated woodpecker if you come too close to his nest. Watch the water: you may see a bald eagle leisurely flying up-stream looking for his fishy supper; you will surely see duck, gulls, snipes, pipers – maybe even a loon. The trail is well signed, so you can learn about your immediate environment as you travel along. The trail is connected with the Ravine Trail which is used by local schools for nature studies, it is lit for travel at night. The Irma Miron Trail, named for the beloved Hay River educator who built the trail. This makes for a loop connected with the Kiwanis Nature Trail for those wanting to stay close to town. The Kiwanis Trail connects with the Old Town Connector Trail which crosses the channel and onto Vale Island. 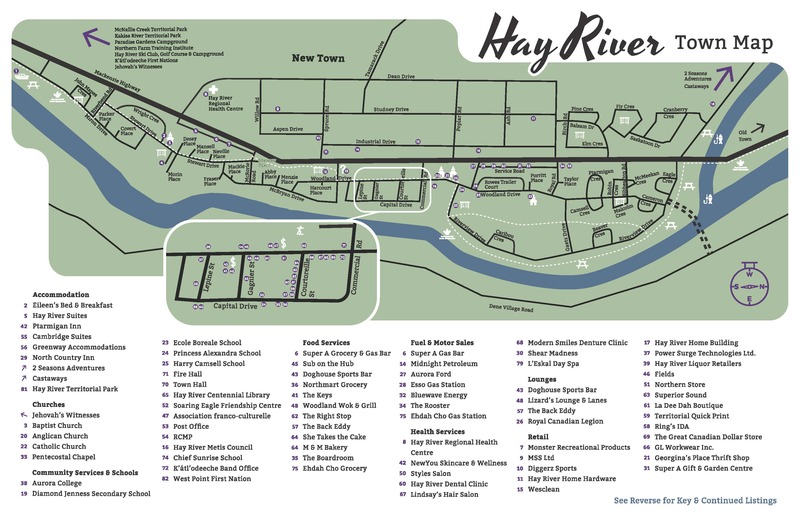 The trail takes you through the historical roots of Hay River as you head towards the lake. The trail skirts by the Merlyn Carter Airport where you can catch a glimpse of Buffalo Airways old warbirds lined up along the edge of the runway. Walk past the most northern rail head end in the country and look for the barges being loaded in the river that transport goods across Great Slave Lake and up the Mackenzie River to the Arctic Ocean. You might even see some of the Canadian Coast Guard ships that patrol the same routes parked on the banks of the river as well. Stop at the Hay River Heritage Museum, housed in an old Hudson’s Bay fur trading building. Be prepared to stay for a while to soak up a wealth of history about the area, its people, culture and how Hay River became ‘The Hub of the North’. 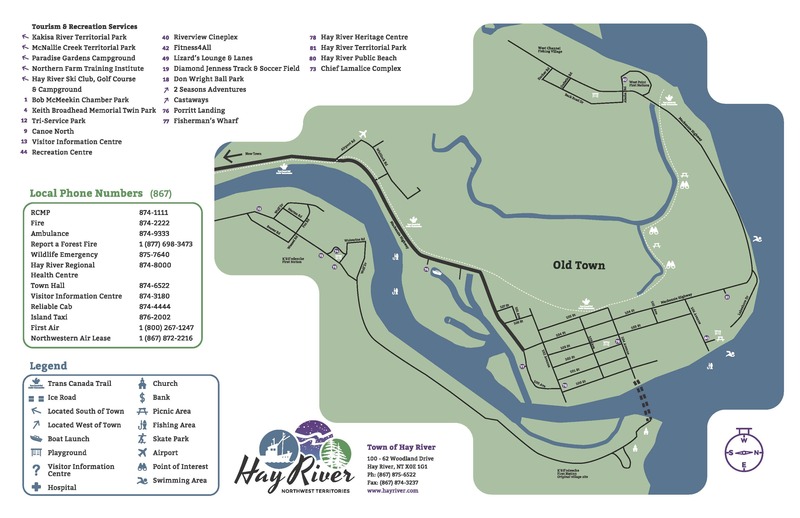 Continue through the streets of Old Town and connect with the Oxbow Trail; this trail is a diverse nature walk following the Snye (backwater creek) which was once an escape route for Spring floodwater until the airport runway was built, cutting it off from the river. Keep an eye out for wildlife and a wide-variety of plants indigenous to the area. The trail runs straight through the island’s boreal forest and ends on the edge of Great Slave Lake. You can walk down along the sandy beach filled with driftwood to wind up back in Old Town again. In the Summer you can canoe down the Snye but we recommend bringing your rubber boots and some bug spray. In the Winter locals often clean off the Snye for skating. All of the Territorial Parks in the South Slave Region are open on May 17th. Once you are in the Wood Buffalo National Park there are also designated day use sites available to make the trip more comfortable. The road is completely chip sealed now making for a very smooth and quick drive. Keep a watch out for wildlife along the road, especially buffalo as they always have the right of way. Please check out the Northwest Territories Parks and Campground site for complete details and contact information at https://nwtparks.ca/.